When you’re moving, the immediate biggest stress isn’t usually how much a new place is going to cost, your surrounding neighborhood, or how weird your neighbor might be. It’s the process of moving itself. When you move, your primary mode of survival is thinking about boxes. One of the truest rants there ever has been is from Jerry Seinfeld’s sitcom. He talks about becoming obsessed with boxes to the point of being able to smell the cardboard. It’s sadly accurate. After researching four major moving sites and one major real estate-themed site, the average consensus is that each room of a home will need eight medium boxes. Medium boxes are traditionally three cubic feet. A few of these sites researched seem to really milk it, as far as how many boxes you need, so two to five medium boxes per room might be more reasonable. If you live with a pack rat, maybe eight boxes per room might be a safe bet. For collectors or borderline hoarders in your life, start with five boxes and go from there. Upon randomly calling numerous moving and storage expert companies, no one was able to give an average number, simply stating it depends on how many possessions need to be moved. Typical boxes used for moving are traditional small boxes, medium boxes, and large boxes with flaps that are taped shut. There are also banker boxes, which have two handle holes to carry it on the sides with a lid to place on top. There are also wardrobe boxes, which stand tall and have a rod on top so that you can keep clothes on their hangers. 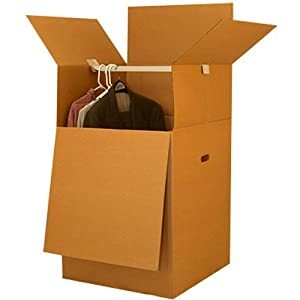 Good alternatives to boxes for packing that can be found around the house or obtained cheaply are suitcases you already own, (clean) milk crates, large durable shopping bags made from a tarp material, and laundry hampers. Where there’s a will, there’s a way! There are very inexpensive moving boxes from home improvement stores, if bought individually. They also sell kits to pack up an entire house, but it’s recommended you perhaps get them one at a time, unless you think you’ll need 48 boxes to move. Type “used boxes” into a search engine to find companies that will sell used cardboard boxes. Try Craigslist for their “free stuff” section under “for sale”. Sometimes, you’ll be lucky and see boxes. If they aren’t free, people will usually sell used boxes for a decent price on Craigslist, too. Look for any new neighbors in your complex or neighborhood. They are likely to still have their boxes and might just give them to you. That, or if a neighbor has bought anything large for their house that would have had a box, they may still have the box. Just ask politely and don’t make it weird. Ask your local grocery store or fast food/coffee joint if they are allowed to give you any large boxes. It usually helps to be purchasing something already, just so it seems like you’re a customer asking for a favor versus some random person wanting a box. If you work for a small business, ask the owner or manager if there is any way to have empty boxes from deliveries. Even if you work in retail, it should be pretty easy to get a manager or shift supervisor’s permission to get boxes. Are you moving into another apartment? You should consider owning a condo, or a house, with a very reasonable, low interest, sometimes $0 down payment, government home loan!